This fishy dish uses tinned tuna which is an excellent source of protein, vitamins and minerals. You could use any root vegetable in place of the sweet potato (but remember it will take longer to cook). 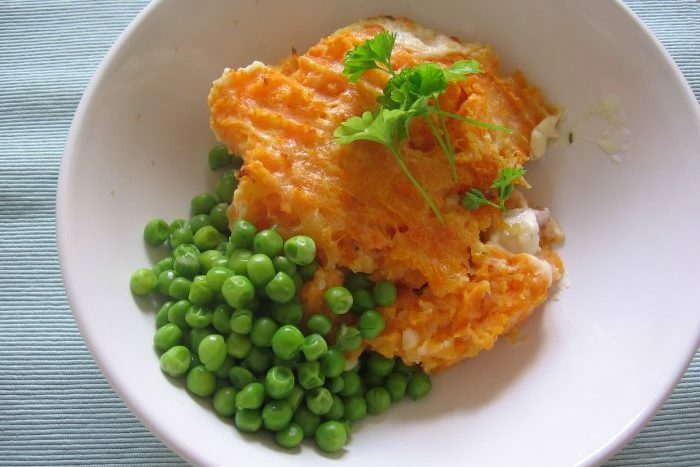 You can also replace the peas with any green veg or try swapping tuna fish for white fish or salmon. For a delicious vegetarian alternative try replacing the fish with butter beans or cannellini beans. Follow a recipe; follow food safety & hygiene rules; tidy away; use measuring spoons and cups; use a jug to measure liquids; chop using the bridge/claw safely; use a vegetable peeler safely; use a box grater safely; mash; whisk; use a colander; use the hob (with adult supervision); season to taste. Vegetable peeler, saucepans, spoons, measuring jug, whisk, fork, bowl, tin opener, colander, wooden spoon, oven proof dish, masher, box grater, steamer. Peel the potatoes and sweet potatoes and cut into chunks (-3x3cm). Place in boiling water and boil for about 10 minutes until the vegetables are tender. While the potatoes cook, put the soft cheese and stock into another saucepan and heat gently. Stir with a whisk, until blended and smooth. Now add the blended cornflour and cook until thick. Drain the potatoes using a colander, keeping back a small amount of cooking water in the pan. 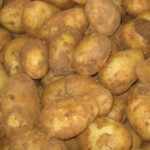 Tip the drained potatoes back into the pan, season with pepper and mash well. Spoon the mash over the top of the fish in sauce, and use a fork to spread it across the whole baking dish. Grate the cheese finely and sprinkle over the pie. Bake for around 30 minutes until piping hot throughout and golden brown on top. Ten minutes before the fish pie is ready, put the peas (or other green vegetables) in a steamer. Add boiling water and steam the veg for a few minutes until tender and piping hot. Use a serving spoon to lift portions onto plates, and add a spoonful of green veg on the side. Easy peasy! 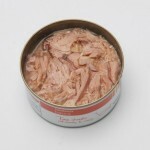 Tuna is an excellent source of protein, as well as a range of vitamins and minerals. Fish is lower in saturated fats than meats so is a really healthy source of protein in our diets.